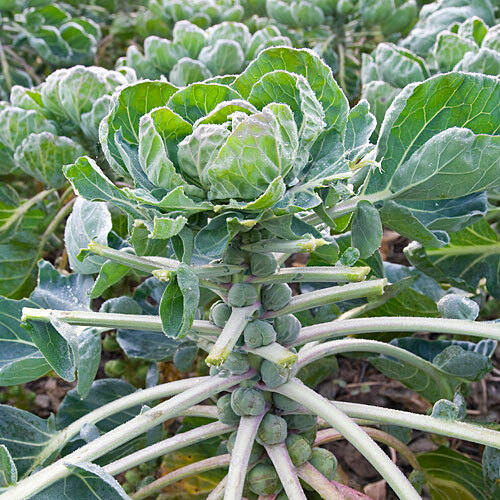 Tender, sweet and delectable “mini” little cabbages, Brussel sprouts are one of my favorite vegetables. Although not specifically a root crop, Brussel sprouts can be stored in the root cellar while still on the stock hanging from the rafters. Larger sprouts keep longer and better than the small ones, but in our house, none last for very long. Selective breeding done in the thirteenth century in Belgium produced for us these tiny perfectly formed vegetables. Brussel sprouts taste best when steamed quickly, or roasted, not boiled to death. They really don’t develop their sweet, nutty flavor until the arrival of cold weather, so now is the perfect time to enjoy them. Alice Waters, of the famed Chez Panisse restaurant in Berkeley, California, likes to slice them thinly, about 1/8 inch thick, sauté them in olive oil or butter and finish cooking them with a splash of chicken stock, lemon juice and salt and pepper. Personally, I love my sprouts in any fashion; tossed with pasta, topped with cheese, or sautéed with nuts. The recipe for Maple Roasted Brussel Sprouts is my pick for a Thanksgiving side dish this year. Our family always enjoys both an orange and green vegetable, and the sprouts win out over green bean casserole. Because we are traveling, I can prepare the dish in advance, transfer to a pretty baking / serving pot, and bring it to the meal ready to heat. If your guest list includes vegetarians, omit the bacon and add some butter or a bit more oil. And if you are fortunate enough to have leftovers or “encores”, they are a delicious addition to a rice and turkey salad. One pound of Brussel sprouts will serve 6 – 8 folks, depending upon the other sides. To prepare in advance, cook until almost done in a single layer. Add to an ovenproof pot and refrigerate for up to 4 days. Preheat the oven to 400 degrees. Grease a heavy baking dish or sheet pan that will accommodate the sprouts in a single layer. Wash and trim the Brussel sprouts, and with a paring knife cut a small X in the base of each sprout. Allow to dry. 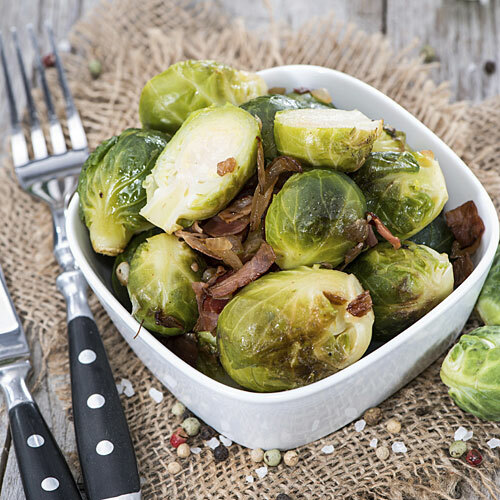 In a large bowl, toss the Brussel sprouts with the olive oil, maple syrup and chopped bacon. Spread in a single layer in the prepared pan. Roast until the bacon starts to cook, then stir and continue roasting until the bacon is almost done. Remove from the oven and season to taste with sea salt and fresh pepper. Add the sprouts to an ovenproof pot (one that can be used for serving). Refrigerate for up to 4 days. To serve: heat in a 400-degree oven until nice and caramelized, about 15 minutes. Makes 6 servings. Nutritional analysis per serving: 125 calories, 3.7 grams protein, 16 grams carbohydrates, 6 grams fat, 113 mg. sodium, 3 grams fiber.